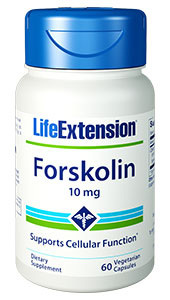 Forskolin - 10 mg, 60 vegetarian capsules (Life Extension) - Penn Herb Co. Ltd. Derived from the ancient medicinal plant Coleus forskohlii, Forskolin’s basic mechanism of action is the activation of an enzyme, adenylate cyclase, which increases cyclic adenosine monophosphate (cAMP) in cells. Cyclic AMP is perhaps the most important cell-regulating compound. Once formed, it activates many other enzymes involved in diverse cellular functions. Take 1 capsule daily on an empty stomach, or as recommended by a healthcare practitioner.